When Geoff Johns first introduced the idea of The Others during his second big Aquaman storyline, I wished that more time had been spent developing the team and showing their adventures. Made up of a variety of unique characters whose only common bond was possession of a magical Atlantean artifact. The Others represented something I feel that The New 52 was largely lacking - history, diversity and something we hadn't seen before. Guest Writer John Ostrander takes a closer look at these characters while introducing a new team member in this interlude issue, which shows the surviving Others taking on a mission that Aquaman can't, due to all the things that currently have him busy in Death Of A King. Those familiar with Ostrander's work on Suicide Squad will find much to enjoy with his script here. Like The Suicide Squad, The Others are made up of people who do not always get along with one another but are professional enough to put aside their disagreements for the common good - one way or the other. 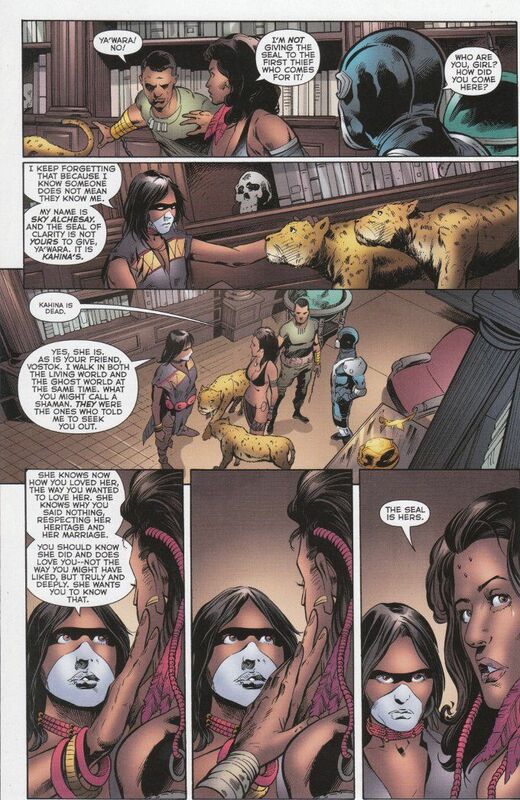 Ostrander also deserves some credit for further diversifying the team, introducing a new Native America hero, who avoids being stereotypical despite her mystic origin. Ostrander also reveals something of Ya'wara (the only jungle-princess character I can think of in modern comics who isn't a blonde-haired Caucasian) and her romantic preferences that further sets the character apart from the common cliche. Sadly, the art fails to live up to the script. Manuel Garcia's pencils are competent enough and his figures are crisp and clear in places. The problem lies with the inkers, of which there are four. Anyone who doubts the power of an inker to make or break a comic would do well to take a look at this issue and take note of how the inking in this book is far from uniform. The inking is too thick in some places, too thin in others and just right in a rare few moments. I applaud DC Comics efforts to give work to as many artists as possible but it would be nice if this book had a single inker or greater effort was made to ensure a more consistent look.